Below is the schematic for the project, as you can see I'm using 6 IN12 nixie tubes, each with it's own 74141 nixie tube driver. These drivers are great! 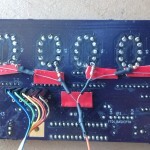 They simply connect directly to the nixies and display whatever 4 bit binary number you give them (if you give them anything above 9 they blank the display - hence why I use the number 10 in my code to blank the nixies). Because they take in a simple 4 bit binary number, I can hook them directly up to some shift registers to drive them, in my case I used 3 74HC595 shift registers (available everywhere), because they can be "daisy chained" together, meaning in the code I only have to write one 24 bit binary number and it will display all 6 numbers on the nixies. Though in reality I split them up into pairs and write three 8 bit binary numbers. For my main chip I'm using an ATMega328P (the same chip as is in the Arduino Uno), and I'm running the arduino bootloader on it so I can program it in the arduino language - just to make things simpler. 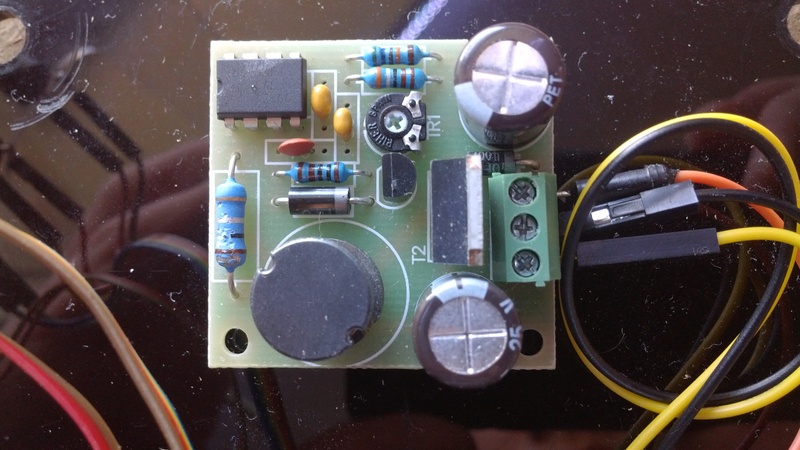 It is interfacing with a DS3232 real time clock chip, which I would highly recommend! It is a great chip which holds hours, minutes, seconds, year, month, date, day of the week (all of which are adjusted for leap years automatically) and it has a tonne of usable SRAM inside it. It's also really really accurate, with a temperature compensated crystal oscillator inside the chip, and fairly easy to interface with (though early on I had some issues - I think it was too much capacitance on the line as I was testing it with cables plugged into the chip socket) over I2C. The only downside I can see is it only comes in a SMD package, which I know some people don't like soldering. Unfortunately I don't have a picture of it, as it's tucked underneath the coin cell battery holder. For the high voltage supply I simply ordered one of eBay, as it was simpler and cheaper than designing my own! The one I used was this one. 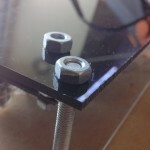 For the case to my project I laser cut an acrylic front and back and used some chunky nuts and bolts I had lying around to hold them together, as well as to hold the PCB in. As mentioned in the video, there is a bug free board available on OSHPark if you want to order my board and build this yourselves, and all my code is up on github, links in the banner to where you can find all that! The KiCad files are unfortunately not available, however the schematic can be found in the blog post, and the board design is available for order at OshPark, or you can download the Gerbers from the same link. Any chance of posting the BOM for this project? 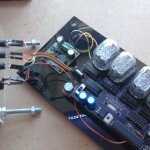 I would like to try and and build one of these using your PCB. The BOM can be found here, if you have any other questions please feel free to get in touch! 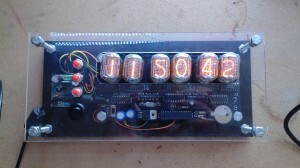 Also if you’re interested we will be selling a Nixie Tube Driver perfect for building this kind of clock soon, if you’re interested you can register for updates on that project here. Sorry I didn’t see the BOM in a previous post. 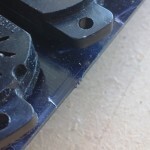 I do have one more question on the DS3232, does is matter which part number I buy? 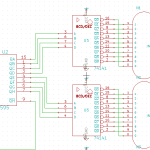 Sorry for the late response, as long as the DS3232 you buy is a SOIC package it should work absolutely fine in this project. 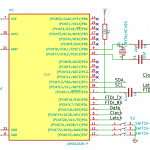 However, if you would like the specific part code of the chip I used, it is the DS3232S#. Thank you for the information and helping and EE newbie. I have one other question would it be possible to use the DS3231 instead of the DS3232? I didn’t notice to many differences in the spec sheet. Having had a quick scan over the data sheet I think it should be possible to use the DS3231, however you must make sure the package and pin layout is the same. Clock works, adjusting Time works, but not able so save it to the RTC. The only other thing I can think of is that you may be using the older version of the code? The newest version can be found here: https://github.com/8163jb/Nixie-Clock/tree/master and is the Nixie_20-04-2016 file. works fine now. Seems, I had an outdated version of the RTC Library. I’m wondering if the libraries I added our not the same version as your code needs? Do you have a source for the SoftI2C.h, DS3232RTC.h, avr/pgmspace.h, string.h libraries? Unfortunately most (if not all) of the libraries I used have been updated and are now incompatible, but I am in the process of re-writing the code for the clock and will update when I can. I have no idea how long this will take however as I am currently focusing on my university final project for the year. All the sections of code devoted to writing a number to the nixies should work just fine, as it requires no libraries. 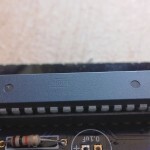 So see if you can find an alternate set of libraries for interfacing with the DS3232. I believe there are a couple available. I have recently updated the code for the project. The new code can be found here: https://github.com/8163jb/Nixie-Clock/tree/master I hope this solves the issues you were having! If not get back to me and I will endeavor to sort them. I’ve reviewed the csv file and have a few questions. Could you please email me more information about the components used, values, dealer/website/RadioShack/etc.? All the values you need are on the .csv file already. As for the dealer, I got mine through a combination of Mallinson Electrical and Farnell in the UK, but only because these are the closest dealers to me and I like supporting the industry in my own country. If you are UK I would recommend these two, but if not I suggest you do a bit of research into who is closest to you. Hope this helps! Thanks for posting such an awesome project. 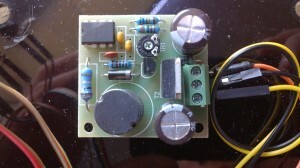 I would like to attempt this (I have ordered your board from OSH) but I am a little unclear as to the component list. 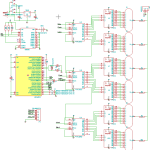 Is it possible to send me a higher resolution image of your schematic; I’m having trouble reading what each component is. 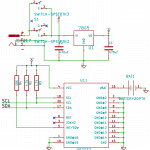 Hi Jason, unfortunately I can’t send you a higher resolution schematic as KiCad does not export them. However I have made you a .csv file with all the components listed alongside their values. It should help you decipher what they are. 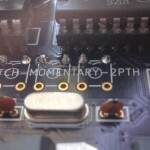 All the references are also printed on the PCB for you to be able to compare. The file can be downloaded here. I hope this helps!